Hi Always Order Dessert readers! My name is Kamran Siddiqi. Some of you may know me as the teen food blogger at The Sophisticated Gourmet food blog. Or you may know me from Twitter (@ksiddiqi92). If we don’t know each other- Nice to meet you! Alejandra asked if I could share a recipe with you while she takes a little break to enjoy her wedding and honeymoon. So today, dear Always Order Dessert Readers, I’ll be sharing a recipe for Tostones (Fried Green Plantains). Sure, these babies may seem as simple as making potato chips, but dear friends, they pack much more flavor and taste much better than potato chips. When I was six-years-old, my mom, sister, and I took a month-long trip to The Dominican Republic to visit my grandparents. The morning of the trip was hectic; Dad had work, Mom was still packing our suitcases, and me and my sister were chasing each other with rollerblades in our apartment at 2:30 in the morning. The neighbors downstairs hated us for that. At the last minute, my sister and I decided that we would pack art supplies to bring to the Dominican Republic. “Mommy, we need these crans and mahkers. And Sabrina needs all of her dollies.” Mom thought that the idea of bringing our crayons, markers, and my sister’s dolls would be a good idea. It was. The plane made a stop in Puerto Rico, then The Dominican Republic. Once we arrived in DR, my grandparents greeted us with hugs and smiles. Grandma and Grandpa snuck me and Sabrina a few pieces of chocolate when Mom wasn’t looking. We hadn’t eaten since earlier that day and it was probably the only thing that everyone in the car thought. Instead of going straight to our grandparent’s condo, we went to Tia Kika’s house- my grandpa’s younger sister- and an amazing cook. She, my grandma, my mom, several other great-aunts, and Tia Kika’s maids prepared a feast for us. The women in our family are known to cook for huge crowds, and that night, thirty people ate. While all of the women cooked, the men played dominoes under the cashew tree, Sabrina and I ran into the kitchen asking to help. Tia Kika asked if I was willing to help her make the Tostones (twice fried green plantains). My job was to smash the tostones with the tostonera with my “big muscles” (I aspired to be Superman). After the tostones were fried up, I was hooked. I demanded that my mom make them when we got back home. And so she did. We had tostones with our meals almost three times a week. Now that I am eighteen, we no longer have tostones regularly, but when we have them- they are always a hit. Today, Always Order Dessert readers, I share a recipe from my childhood with you. Enjoy! Slice the ends off of both plantains. Make three vertical cuts along each plantain, only making sure that you are cutting into the skin. Under cold running water, using your fingers or a butter knife to remove the skins. Slice each plantain into ¾-inch to 1-inch slices. Set aside. Mix the 3 cups of water and salt together (just until the salt is dissolved). 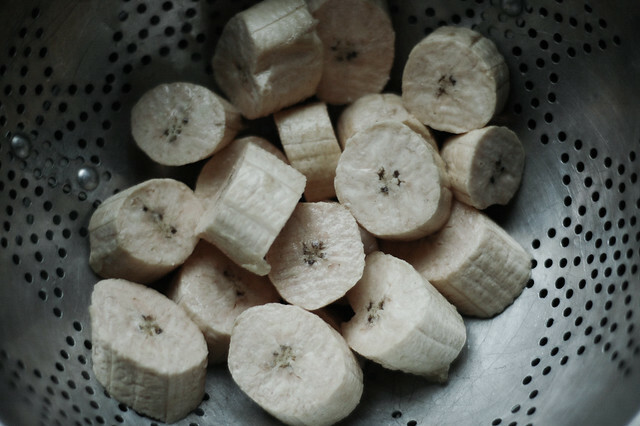 Place the plantain slices in the salt water for ½ hour or no less than 10 minutes. Remove the plantain slices from the water and dry them well. Heat the oil on medium heat (Oil should be around 325ºF). In batches, place the plantains in the hot oil and cook for about 4 minutes on each side until golden brown. Repeat with all the plantains, then remove from the oil and drain. Place one of the fried plantains between two pieces of parchment paper. Using a heavy sauce pan or cast-iron skillet, smash the plantain down until it is very thin. Repeat with the rest of the fried plantains. While smashing all of the plantains, crank the heat to high (the oil should register 350ºF to 360ºF). 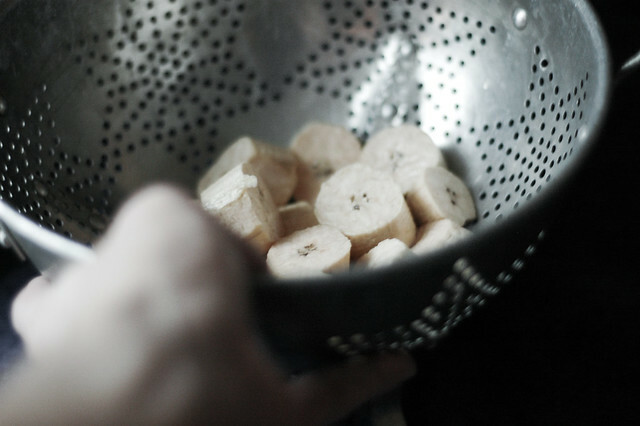 After all of the plantains have been smashed, fry them once again until golden brown and crispy. Immediately salt them as they come out of the oil. Enjoy.